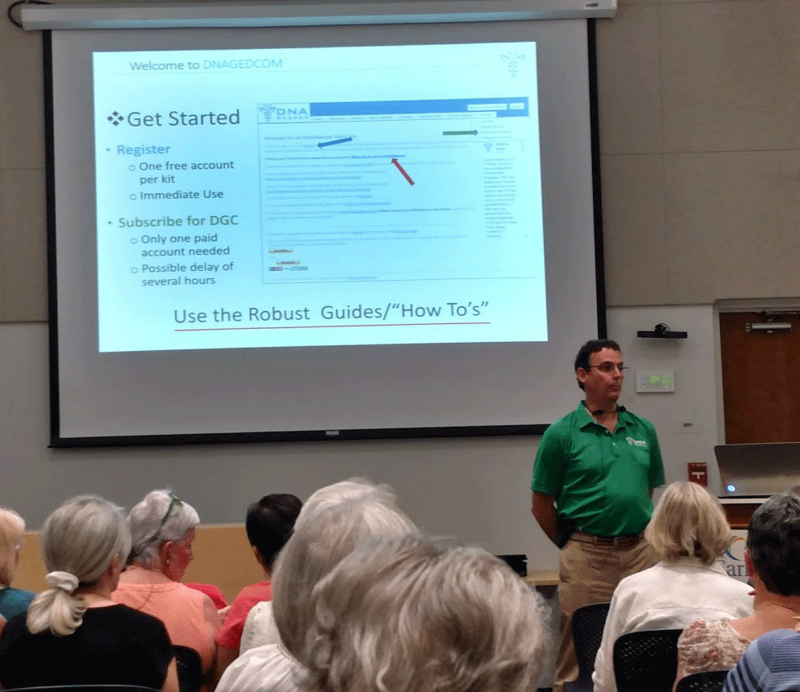 I recently reported on the amazing ease of using Gworks at DNAgedcom to get to grandparents or great grandparents of adoptees with deep American roots in a post about my jamboree workshop. The method is to find a likely couple in the match file the tools generate that appears in many of the collected trees. Then build a tree down from them. The trick is to use surname frequencies for the spouses to find the most likely lines to follow down. Once you get to the grandparents or great grandparents it gets trickier because living people are harder to search for. So I usually continue with mirror trees for their descendants with their spouses trees to find the most likely line, the one where you get hints from the spouse’s ancestors. I have now used that technique successfully several more times. However GWorks was not a success when I tried it on a Jewish case and on a Norwegian case. There were not enough Norwegians at Ancestry.com for the latter and too many with very shallow trees for the former. So what next? Family Tree DNA also has trees and many Norwegians but currently you cannot collect those trees with DGC. The workaround is to collect them manually with the chrome add-on DNArboretum followed by my tool Ahnen2GED (click either name to get to those articles). Then use the top menu item under Gworks page “Upload Gedcom Files.” Follow that with the bottom button “Load GEDcom files’ on the Gworks “Manage Tree Files” page and then click each of the other buttons from the top. I am trying this for my Norwegian adoptee with no success yet. So what else can you do? Use the segment data analysis tools to identify a promising triangulation group, see if you can find a common ancestor, (this may require building their trees back yourself). then build the tree for their descendants forward in time looking for people in the right place and time. 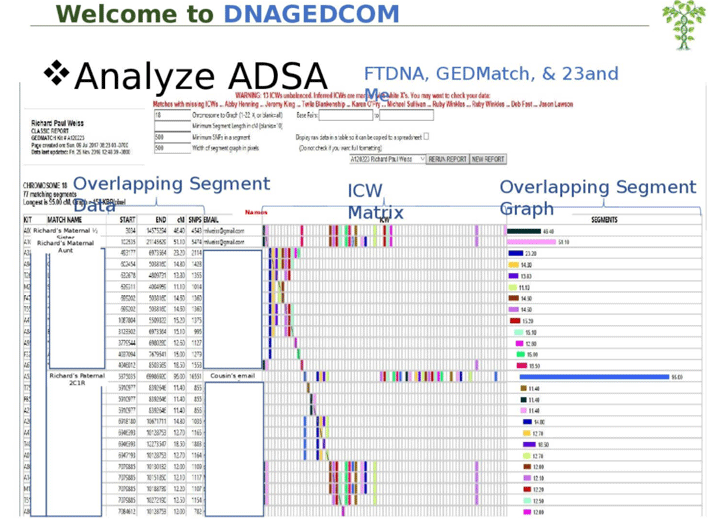 There is a wonderful tool called ADSA for visualizing possible triangulation groups from your family tree DNA matching segment data that DGC can collect. For working the data with spreadsheets, there are Kworks and Jworks. These tools can also be used with your GEDmatch matches data. Richard went into detail in his presentation but the best way to learn how to use these tools may be to take an online class from DNAadoption.com . An important fact for search angels or other folk who work with multiple trees is that you have to have a separate DNAgedcom account for each person so as not to get other trees mixed in with your case, plus each one needs to be paid while you are actively using the client (DGC). If I use segment data for my Norwegian case and resolve it that way, I promise to blog about how it was done. It does not look like the ICW files for FTDNA are loaded anymore during a download. Thus the ICW matrix no longer seems to show up in the ADSA. Brad you need the most recent version of the client (DGC) to get those and it will not currently get the trees.